Nestled at the foot of Pikes Peak in Colorado Springs, Colo., Wybron invents, manufactures and markets cutting-edge lighting products that have transformed the entertainment, church and architectural industries. In its state-of-the-art, 50,000-square-foot manufacturing facility, Wybron puts innovation, quality and world-class service to work every day. Wybron invented the scrolling color changer in 1980, and it forever changed the way lighting designers execute their visions. But that was just the beginning. Wybron's burst of innovative energy continued, resulting in a continuous stream of products and accessories that became industry standards. Wybron's Coloram IT color changer continues to dominate stages worldwide as designers demand it for its unmatched range of features, easy utility and dependable performance. The CXI IT offers a nearly infinite color palette and real-time color adjustment, all from the comfort of your console. The Eclipse IT Shutter and the Eclipse IT Iris, our popular DMX-controlled dowsers, mechanically do what can't be done electronically: give designers real control over their HMI and other electrically non dimmable lights. 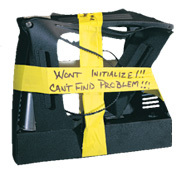 Tying all our equipment and other RDM-capable gear together is the Infotrace Control and Management System. Never before have fixture options and operating information been so readily available from the desk via standard wiring and equipment. Our latest engineering challenge has been in the area of LED sources. We have partnered with CREE to make bright, reliable, and consistent fixtures. Take a look at Cygnus fixtures to see the way we view the post-incandescent era unfolding. As one of the largest stage lighting suppliers and manufacturers, we have the opportunity to be involved in projects that encourage us to push the limits on what can be done. With Wybron's commitment to innovation and the industries we serve, there's no telling what we'll come up with next. One thing's for certain: It will meet Wybron's high standards for innovation, quality and dependability. 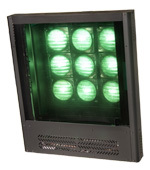 Innovation in manufacturing has made the Wybron name synonymous with reliability among stage lighting suppliers. Skilled personnel at all levels make it a reality, and a purposely vertical orientation makes everyone accountable, assuring quality fabrication from start to finish. Investment in manufacturing makes our products better and our jobs easier. 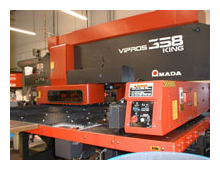 Our line features the most advanced equipment available: the Amada Vipros 358-58 station CNC turret punch press, the Amada CNC brake, the Haeger 816 hardware insertion hydraulic press, the Trans Tech Combo 130 pad printer, the Nordson Horizon 400 fully automatic eight-gun powder paint system and now the Daewoo CNC turning center. This CNC equipment is investment spending at its best: It integrates computer-aided engineering with the fabrication process, making the final fit and finish as close to perfect as possible. At Wybron, because our name is on the line, nothing less will do. With innovation as a bedrock value, it's no surprise that Wybron's electrical, mechanical and software engineers are truly best in class, using the most leading-edge tools available. 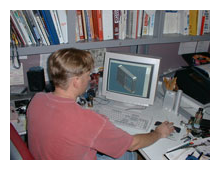 Mechanical designs are developed using Solid Works, a powerful parametric CAD system for solid modeling. It speeds development time, reduces error and sets the stage for computer-driven manufacturing with minuscule tolerances. The embedded software that drives our products is written in C, then debugged using an in-circuit emulator. Product electronics are designed with state-of-the-art RISC and DSP microprocessor technology and manufactured with industry-leading robotic surface mount assembly equipment. These engineering disciplines ensure efficient design, precision manufacturing and the "never fail" reliability so integral to the Wybron name. Please contact us with any questions about your specific needs or any questions about our products. We are passionate about what we do and our goal is to continue to be ranked among the world’s best stage lighting suppliers.